One Direction is definitely not a flash-in-the-pan one-hit wonder produced by X Factor. They are a household name now, having earned over 77 million in the past 3 years. They graced X Factor Live last weekend with a rendition of their new single, “Steal My Girl.” The audience went hyper and the sound of their applause was deafening. It was everybody up, thanking these young boys for their tremendous talent. And Simon Cowell? He sat smugly with a smile on his face, knowing his boys are his golden goose. Harry, Niall, Zayn, Liam and Louis showed Melanie B and Cheryl Fernandez-Versini that it was all about boy power. Fresh from a pre-Christmas break, the lads sang their new single Steal My Girl. Clearly designed to keep their fans happy, the track is composed to give each of the band a chance at lead vocals. Zayn opened the track, which was then picked up by Harry and Niall respectively. Singing live, the band certainly showed that they’ve certainly honed their skills – delivering strong pop performances. Wearing black matching outfits, the five-piece cut cool figures as they headlined the ITV talent show. Naturally, Simon Cowell used the opportunity to remind the Great British public that they’ve sold over 47 million records and achieved 95 worldwide Number 1s. That said, they should surely be confident in their abilities by now – the stars were recently named Britain’s richest young stars. The boyband topped Heat magazine’s annual under 30 rich list for the second year in a row, pushing Harry Potter star Daniel Radcliffe into second place once again. Despite thier humble beginnings, collectively, Louis Tomlinson, 23, Niall Horan, 21, Zayn Malik, 21, Harry Styles, 20, and 21-year-old Liam Payne have reportedly raked in a humble £77.5 million. 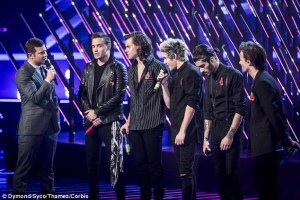 One Direction continues to gain audience share and fame as they release their new hits. They’ve announced a new tour to the X Factor audience’s deafening applause. If some of the current acts on X Factor aren’t that exciting, One Direction was certainly no disappointment. How Cheryl Cole wish they were her act! X Factor has produced a number of fine acts over the years, and One Direction may just be their finest.